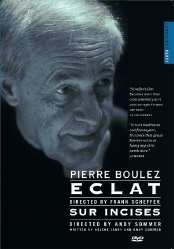 Here is a didactic pair of TV films which finds Pierre Boulez astonishingly fluent in rapid exposition of his thoughts surrounding two of his most acclaimed compositions. The earlier film follows Ed Spanjaard teaching himself and his Nieuw Ensemble to understand, conduct and perform Éclat - he began by thinking that it could only be possible for the composer himself to do! Gradually we are able to share the pleasure of the freedoms built into the composition, which requires instant responses to unpredictable signals. A sense of liberation and very exhilarating for everyone. The later film is edited from what is effectively a public master class for well prepared secondary schoolchildren, turned into a contemporary TV film utilising all techical possibilities. Both are completed with concert performances of the works which had been put under the microscope, and no one could then see them without having absorbed insights into the compositional thinking, with musical examples which will have engendered a sense of familiarity. If you are interested thus far, I recommend accessing fuller information, on the Juxtapositions microsite, with video samples of each film on line. It is one of the most absorbing DVDs of any we have seen. The filming brings the music to life with an immediacy which is rarely experienced in the concert hall; we had been confused and disappointed by the complexity of Sur Incises more than once in venues with poor sight-lines and acoustics. The quality of presentation is quite uncommon for DVDs, with comprehensive essays by Frank Scheffer and Hélène Jarry. If the other DVDs of Mahler, Stravinsky, Part and Glass are of comparable excellence, we have lighted upon a veritable treasure-trove for collectors who want to learn whilst enjoying seeing and hearing difficult ground breaking music. I have now been able to take a little time to explore six more of Scheffer's films, paired in the admirable Ideale Audience International series of DVDs; those on Mahler, Schoenberg, Stravinsky and Berio. They have been a wonderful discovery and (lacking the possibility for full individual appraisals, given the demands upon an editor/webmaster) I hasten to share my excitement and give them to adventurous collectors the warmest welcomes and recommendations; they should all be in every music college's library. Scheff's methods are collages, with cut-and-paste techniques which parallel modern-day writing with computers, and this note is likewise. Moments from one film appear on others. Mahler is explored exhaustively through the faces and thoughts of four great conductors. These films are of an enduring interest and repeat watchability which cannot be said for many concert DVDs (Gunter Wand's Bruckner performances a notable exception). Each of the works examined is at the cusp of a new world transition and helps us to make sense of today's confusing musical scene and towards a deeper understanding of the work which conductors and orchestras undertake before appearing in front of the public. There are invaaluable archive clips of Stravinsky and Schönberg. Haitink, Chailly, Abbado and Rattle share with us their early discoveries of Mahler (reminding me of mine as a student; Bruno Walter's Lied von der Erde and 9th - on about 10 78s - and Heinz Unger's introduction of the 5th to London) and their different coming-to-terms with the earth-shaking music. Chailly is fascinating about his ambivalent relationship with the Concertgebouw, steeped in proud tradition back to Willem Mengelberg. I have learned most from the examination by Craft & de Leeuw of Stravinsky's 'montage technique' in Symphonies of Wind Instruments, the structure and character of the composition informing the style and editing of Scheffer's film. And from the ailing Berio (d.2003), who brings new and fuller life than experienced in the concert hall to the depth of allusion in his Mahler commentary on the Scherzo of Symphony No. 2 which forms the central part of his Sinfonia - ' a dense fabric of verbal quotations contained within a musical quotation, which is borrowed virtually wholesale and then used as a kind of musical armature around which Berio concocts a dazzling semantic and musical labyrinth, including further quotations (from Mahler, Ravel and Debussy, among others) and chattering texts drawn from Samuel Beckett's The Unnameable' (Composition Today).